The eight members of the Suppressor of Cytokines Signaling (SOCS) family are SOCS-1-7, and CIS (cytokine inducible SH-2 domain protein). Structurally the SOCS proteins are composed of an N-terminal region of variable length and amino acid composition, a central SH2 domain, and a C-terminal motif called the SOCS box. The SOCS proteins appear to form part of a classical negative feedback loop that regulates cytokine signal transduction. Transcription of each of the SOCS genes occurs rapidly in vitro and in vivo in response to cytokines, and once produced, the various members of the SOCS family appear to inhibit signalling in different ways. SOCS-1, also called JAK binding protein (JAB), is an SH2-domain containing protein. It interacts with all four Jak kinases (Jak1-3 and Tyk2) and inhibits the signaling action of IL-3, IL-4, IL-6, growth hormone, LIF, Prolactin, interferon gamma (IFN-g), and erythropoietin. It plays an important role in the negative regulation of IFN-? signaling and in the differentiation of T-cells. Biochemical characterization and gene disruption studies indicate that SOCS-1 is an important negative regulator of the JAK-STAT signal pathway. Fig. 1: Immunoprecipitation of SOCS-1 from mouse splenocytes (1) and mouse thymocytes (3) with AM26561AF-N (1,3) or mouse IgG1 (2,4). 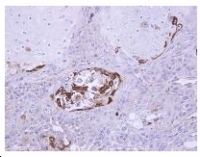 After immunoprecipitated with the antibody, immunocomplex was resolved on SDS-PAGE and immunoblotted with biotinylated anti-SOCS-1 monoclonal antibody. SOCS-2, also known as CIS2, is capable of inhibiting cytokine signalling by interleukin-6 (IL-6) and growth hormone. SOCS-2 interacts with the phosphorylated insulin-like growth factor (IGF-I) receptor, where it may play a regulatory role in cellular growth, differentiation, and inhibition of apoptosis via the Ras and PI3K signalling pathways. Fig. 3: AP15780PU-N SOCS2 antibody staining of Human Pancreas. SOCS-3 is an important regulator of fetal liver haematopoiesis. It is also involved in a broad spectrum of cytokines, e.g. IL-2, IL-3, IL-4, IL-6, Epo, Prolactin, and GH. Fig. 4: Immunoprecipitation of SOCS-3 from mouse hepatocytes with AM26562AF-N (1) or mouse IgG1 (2) After immunoprecipitated with the antibody, immunocomplex was resolved on SDS-PAGE and immunoblotted with biotinylated anti-SOCS-3 monoclonal antibody. Fig. 5: AP15781PU-N SOCS3 antibody staining of Human Placenta. 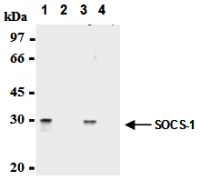 SOCS-4 expression, in contrast to SOCS-1-3, does not appear to be EPO inducible. There also appear to be differential stabilities of the SOCS transcripts, SOCS-2 is the longest-lived and SOCS-1 and CIS the least stable. There is also evidence of EPO-independent expression of SOCS-3 and SOCS-4. Fig. 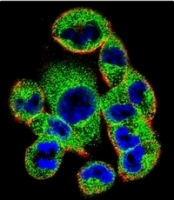 6: Confocal Immunofluorescent analysis of SOCS4 antibody (Center) Cat.-No AP53981PU-N with A2058 cell followed by Alexa Fluor 488-conjugated Goat anti-Rabbit lgG (green). Actin filaments have been labeled with Alexa Fluor 555 phalloidin (red).DAPI was used to stain the cell nuclear (blue). During Th1 differentiation a reduction in the association of Jak1 with the IL-4 receptor correlated with the appearance of SOCS-5. SOCS-5 protein was preferentially expressed in committed Th1 cells and interacted with the cytoplasmic region of the IL-4R alpha chain irrespective of receptor tyrosine phosphorylation. T cells from transgenic mice constitutively expressing SOCS-5 exhibited a significant reduction of IL-4-mediated Th2 development. Therefore, the induced SOCS-5 protein in Th1 differentiation environment may play an important role by regulating Th1 and Th2 balance. Fig. 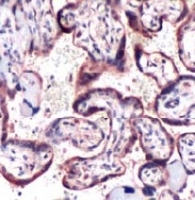 7: Immunohistochemical analysis of paraffin-embedded Ca922 xenograft using SOCS5 antibody (AP19008PU-N at 1/100 dilution). 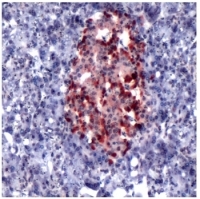 SOCS-1 and SOCS-6 interact with the insulin receptor when expressed in human hepatoma cells. SOCS-1 and SOCS-6 inhibit insulin-dependent activation of ERK1/2 and protein kinase B in vivo and IR-directed phosphorylation of IRS-1 in vitro. These results suggest that SOCS proteins may be inhibitors of IR signalling and could mediate cytokine-induced insulin resistance. Fig. 8: AP15782PU SOCS6 antibody staining of Human Placenta. OriGene Technologies offers a collection of polyclonal and monoclonal antibodies to members of the SOCS family. 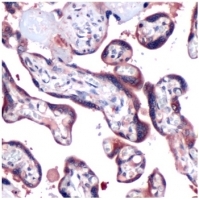 These antibodies are useful for detection of SOCS1 – SOCS7 or CIS1 using Western blotting, immunoprecipitation, Immunihistochemistry or ELISA. 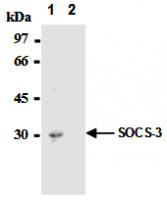 SOCS1, SOCS2, SOCS3, SOCS4, SOCS5, SOCS6, SOCS7, CIS antibody.